Airlifts use much less power! For small systems, a small pump is probably much easier. However, when you need to move 500+ gallons per hour, the pumps have increasing power requirements that make solar and off grid living expensive. The air lift however uses sometimes as much as 1/4 of the power that a traditional pump uses, and it also oxygenates the water at the same time. A 25W air lift pump designed around a geyser system that burps bubbles to lift water can move about 500 gallons per hour, and can lift it several feet. It would require almost 100 watts to move 500 gallons per hour with a regular pump and once you try to lift the water beyond 3 feet, power nearly doubles again! Read our articles on air lift tests and see which one will fit your system if power is a concern for you. In a one year period, the air lift/geyser type pumps will actually pay for the cost of a whole new pump in electricity savings too, so it’s a no brainer that you should be using air lifts or geyser pumps to move water, not traditional pond pumps. When using air pumps to move water in very large commercial systems, a single compressor can pump through multiple tanks, so the savings in hardware is realized that much faster. If you are designing a system for off grid, or planning a battery backup solution, you need to know exactly what the power draw on the pump is. This calculator will give you estimates to assist with your power backup planning and show you the value of using one pump over another. First, we need to get the power factor of the ac circuit you are working with. The instant PF for an AC circuit is the same as a DC circuit (P=VI), but for AC it is measured in rms as an average. Think of power factor as electricity lag. Usually, for a home user the PF will be 1, but if you have an industrial complex the power factor can be significantly different. Lagging power factor means the current lags the voltage, much like an inductor. Often large motors and industrial complexes use capacitors to correct the power factor. Why is PF so important? For the hobbyist that has a small aquaponics pump, it’s not important. Just use 1 as the power factor. However, if your power factor is lower, the math changes and you pull more amps than is necessary, thus draining batteries faster and possibly burning up circuits or kicking circuit breakers. Power factor can also be calcuated as: PF = True Power / Apparent Power, or PF = Watts/Volt Amps. There is quite a bit more physics and high level math involved, but for the hobbyist, this is as far as you need to go probably, or just use “1” if you are not sure. If you are calculating DC circuits, always use “1” for Power Factor. Batteries are rated in Amp Hours (Ah), and a battery will run depending on how many amps are dran out of that Amp Hour Pool. A typical computer UPS battery is a 7 to 9 Ah lead acid battery. A typical solar battery backup is a sealed gel deep cycle battery with a rating of anywhere from 75Ah to 200Ah or more. You are pulling 1 Amp per hour, the battery has a 200 Amp Hour rating… you can pull up to 200 hours until the battery is dead. If you do drain a battery down to nothing, it’s ruined. Instead, you plan for only 50% draw. So a 200 Amp Hour Battery might give up to 100 hours at 1 amp draw theoretically. However, if you try to pull 100 amps from the battery in a shorter time than 100 hours, it will give you significantly less run time. As batteries heat up, they do not function as well (also if they are too cold). With this in mind, it’s best to design a small load on a large battery bank and leave 50% unused at all times. Furthermore – regular lead acid batteries are not designed to drain down very much at all, and if you try to drain them down to 50% or less, you will destroy the battery making future recharges impossible. 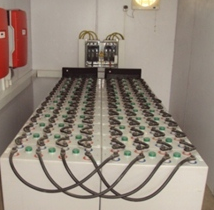 AGM and sealed gel deep cycle batteries are designed to take this type of discharge though so you should use a “deep cycle battery” in your battery backup solution. Currently, a 200 Ah battery lasts 5-7 years if properly used, and cost about $350. This expense adds up extremely quickly! There are more expensive batteries that last up to 15 years, but you’ll pay the same as buying a few of the cheap ones. This entire section has been devoted to showing the importance of using the smallest pump required to do the job and why alternatives like airlifts are so awesome. 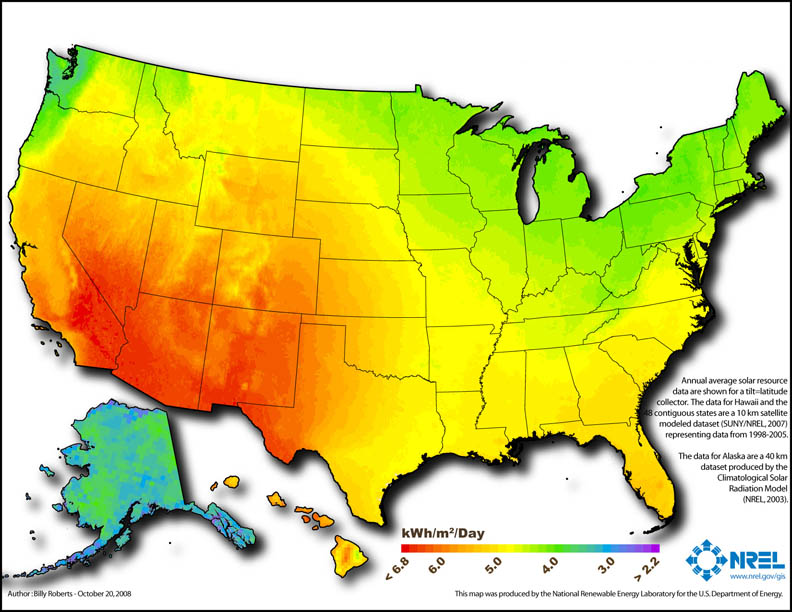 Next, winter sun can be as little as 50% of what the full daylight sun is for your area, so if you want to run solar in the winter, only count for 50% of your total average sun hours to make sure you have enough. Now, we need to know how much power to put into the battery bank each day to make sure it can be recharged each day. Basically this is twice as much power as the system consumes with about 25% room for various losses. The map below will show you approximate hours. Remember though that this is average over the whole year, and we need to make sure we have enough power during the winter, so if I’m in dallas texas with about 4.8 hours per day average – I will input 2.4 to account for winter. During the summer I’ll produce far more than I need, but I’ll have enough for the winter. An alternative is to run your pumps on timers during the winter and purchase less panels. I would recommend just getting the panels though! During the summer you could probably run a swamp cooler or window unit for free off of the excess power produced and still have more than enough left over. Just the note that deep cycle sealed lead acid batteries (AGM or Gel Cell) tolerate deep discharges up to 20-25% of their full capacity, especially when drained with low currents – this can help in slightly decreasing initial costs.